The plan of diversing Acheloos River was first initiated in 1925. 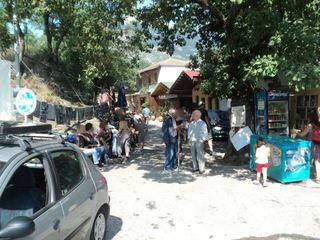 Main goal of the project was to transfer water from Acheloos River in Western Greece to the plain of Thessaly in East Greece, through the Pindos mountain chain. Thessaly plain is the biggest agricultural area in Greece, and since early 80’s the implementation of the project has been used as a promise to Thessaly’s farmer by many political parties, especially the main ones. In the meantime the production of electricity was also added to the project goals. 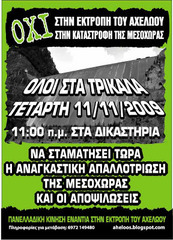 It’s still one of the biggest, environmentally destructive, technical complicated and expensive projects in Greece. The main goals of the project were the irrigation of Thessaly plain and electricity production, along with the water supply of cities in Eastern Greece (Volos and Larissa) and the ecological feasibility, as Pineios, Thessaly’s biggest river, as well as underwater aquifers, are degraded due to over abstraction and nitrates’ pollution. The ecological importance of Acheloos River is significant. Acheloos plain belongs to NATURA 2000 Network and the complex of Acheloos estuary along with the lagoons of Messolonghi and Aitoliko are considered as areas of great ecological and aesthetic value and they are protected by RAMSAR Convention. In Acheloos River basin there are forests with riparian vegetation, alpine and subalpine habitats in very good condition. There is a richness of plant and animal species, a considerable amount of which are endemic, as well as mammals and birds. 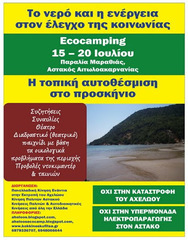 Furthermore, Acheloos estuary is one of the most important wetlands in Greece and an important area for migratory birds. In addition to this, important cultural and architectural places are located in Acheloos River basin. 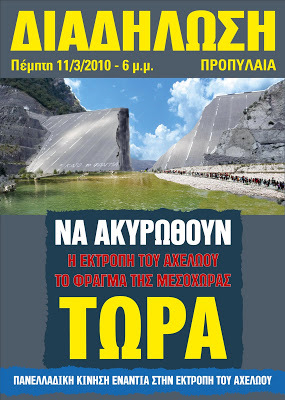 Along Acheloos River four (4) hydropower dams are already in operation. It was first in June 1984 that the Public Electricity Enterprise submitted a preliminary study identifying alternatives for the construction of the project. The first plan comprised the transfer of 1.1 million m3 of water to Thessaly through dams, reservoirs, tunnels and Hydroelectric Power Plants. 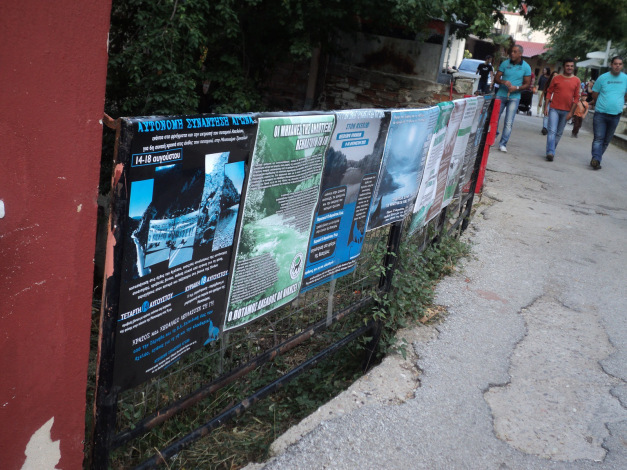 The project was planned to be funded by EU, but in the meantime EU decided that it won’t fund irrigation projects anymore and the Greek government tried to present the project as hydroelectric power production project only [1, 2]. 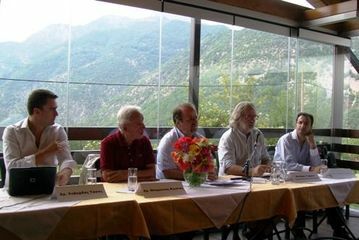 In 1993, environmental organizations, stakeholders and local authorities from the Region of Western Greece filed two actions before the Council of State against the ministerial decisions that approved the project’s Environmental Impact Assessment. In 1994 the first decisions were issued (2759-2760/1994) by the Council of State, asking to stop the works and for the submission of an EIA for the entire project, as it would have serious impacts on the environment. Then, six more decisions were issued by the Council of State against the continuation of the works. 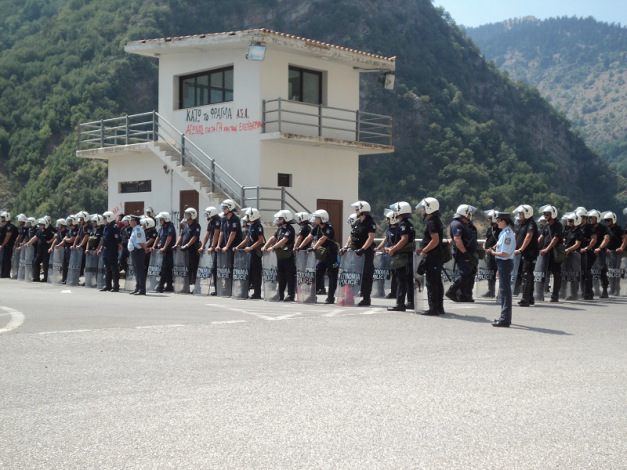 In the decision 3054/2009, the Council judged that the project infringed the EC legislation and submitted 14 questions referred for a preliminary ruling to the Court of Justice of the European Communities. According to the Court of Justice decision the way of planning the river diversion infringed the EC legislation and the plan was based upon inadequate and outdated data and ignored the minimum legal requirements for water management. The project’s EIA was also based on outdated and unreliable data for the ongoing interventions in NATURA 2000 sites and for the purpose of the project, i.e. to irrigate the plain of Thessaly. Following that, the Council of State’s final decision (26/2014) confirmed the previous judgements, pointing out that to date project planning is contrary to the principles of sustainable development and violates EU legislation for the protection of the environment since 1991. Furthermore, the data of planning and operation of the project has been modified without the submission of the necessary assessments (EIA, etc.) [2, 3]. Despite the Council’s decisions, the works went on all these years. 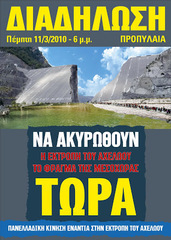 Today the project is part of the River Basin Management Plans of both Regions (Western Greece and Thessaly) and foresees the water transfer of 250 million m3 for the environmental rehabilitation of Pineios River, while there are no new Environmental Impact Assessments or feasibility studies and there is serious criticism on the data upon which the RBMP were based [4, 5, 6]. 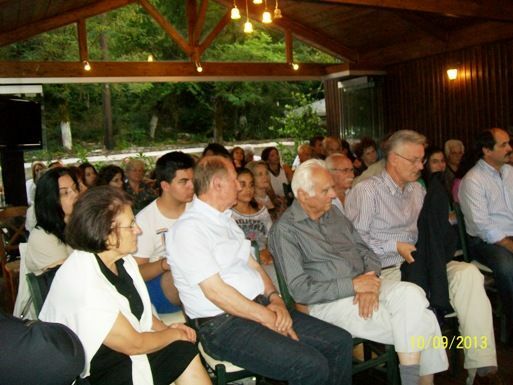 From the beginning of the project there was a major reaction from stakeholders, local authorities and citizens groups from Western Greece Region. Especially in Messochora, a village which will be covered under Acheloos waters when Mesochoras’ dam starts operation, information events, debates, activists’ camping and demonstrations etc. were organized. Although the Council of State decisions put obstacles to the project the last two decades, the Ministries ignored them and the construction continues. A major issue is the funding of the project, as it could not be funded by EU and it’s not yet clear the total amount of money needed in order to bring the water to the irrigated lands in the plain of Thessaly. 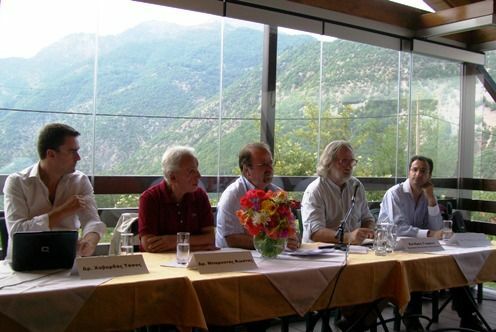 Development of Alternatives Environmental NGOs along with university professors and researchers insist that water scarcity and pollution problems in Thessaly plain won’t be solved by Acheloos River diversion and the transfer of more water. The open irrigation channels, the crops (mainly cotton and other crops with high irrigation needs), the irrigation and agricultural technics (ie irrigation cannons, irrational use of pesticides) and the irrational water use (ie time of irrigation), are responsible for the degradation of surface and underground aquifers in Thessaly plain. There are concrete suggestions for the construction of small dams and the better exploitation of rainwater in the plain, the enrichment of underground aquifers, the change of crops and of the agricultural and irrigation technics. These measures will improve the agricultural production and the financial situation of the farmers in Thessaly, without destroying another area (the Region of Western Greece). Unfortunately, the government and the ministries constantly ignored the alternatives proposed and they insist on the continuation of the works. Why? Explain briefly. The case of Acheloos River diversion can be considered as an environmental justice success, as there are 7 decisions from the Council of State against the project. However, for twenty years, governments ignore these decisions and continue the construction. 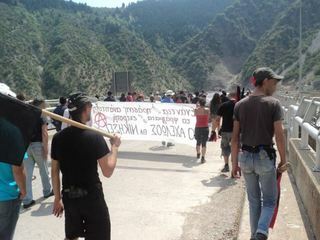 Today, Messochora’s dam is constructed; the tunnels for transferring water to Thessaly plain have been opened, although support is needed and there are problems of water inflow; Sykias dam is under construction. This infrastructure has already provoked major degradation of the environment. Furthermore, the Ministry of Environment, Energy and Climate Change, in an effort to make the project be in accordance with EU legislation, present it as an environmental rehabilitation, trying to overcome juridical objections. Given that, the movement declares that it will continue to fight for the definitive cancelation of the project.